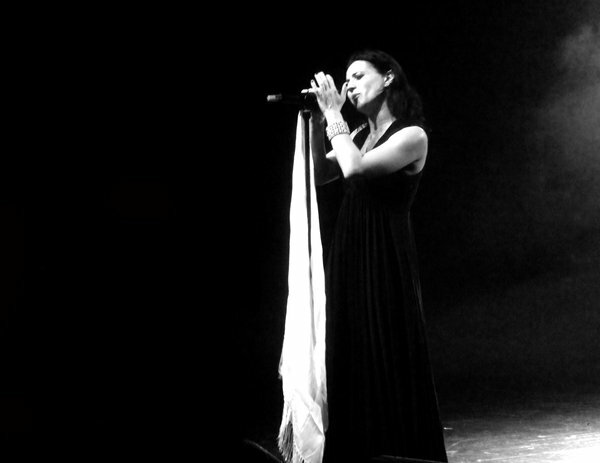 Cristina Adriana Chiara Scabbia was born on the 6th of June 1972 in Milan, Italy. As a child Cristina was influenced by all different genres of music, but one of her first influences was Genesis, Led Zeppelin, AC-DC, and traditional Italian music. She has 2 brothers and a sister, all of them had different tastes in music. Christina started listening to metal music in her 20’s. In 1991 Cristina started singing professionally as a touring musician for other bands and mostly provided backing vocals. Later that same year she met male vocalist Andrea Ferro and Marco Coti Zelati from the band which was formerly known as Sleep of Right. The band later changed their name to Ethereal. In 1996 the band changed their name for a third time after a Greek band had already claimed the name Ethereal. Lacuna Coil is a mix of Italian and English words and can be translated as Empty Spiral. Cristina was first employed only as a session singer. She was initially only employed to give backing vocals for the choruses of the songs that was going to be on their demo tape. The band started to like the way the male/female vocals sounded together and asked Cristina to become a permanent member. The band recorded a two track demo tape in May of 1996 and they were soon signed by the German branch of Century Media, eventually joining the American branch as well. In 1997 Lacuna Coil played their first live concert supporting their label-mates Moonspell. Anxiety, stage-fright and intense emotions led to the break-up of the band. Their debut self-titled EP was recorded at the Woodhouse Studio in Hagen, Germany. Shortly after, there came the departure of bandmates Raffael Zagaria, Claudio Leo, and Leonardo Forti. After several changes to the band’s line-up, only three members from the original line-up was left, namely Andrea, Marco and Cristina. Cristiano ‘CriZ’ Mozzati (drums) and Cristiano ‘CriZ’ Mozzati (guitar) officially joined the band in 1998. Not long after their second tour they recorded their debut album, In A Reverie, adding another guitarist Marco Biazzi in the process. Since then the band has released 5 more studio albums. Cristina started dating guitarist Marco Coti Zelati around about 1994, their relationship lasted about 10 years and they went through an engagement period before they broke up. They still remain friends and professional partners. Cristina is currently dating James Root, one of the musicians from Slipknot and Stone Sour. Cristina writes an advice column in the popular rock magazine Revolver alongside musician Vinnie Paul. Cristina has been featured as a guest artist several times.